Wolves are shy and elusive, inhabit most of Alaska, and are difficult to photograph because of their elusive ways. Their color phase can be from a black to nearly white color. They are strong animals that weigh on average from 85-115 pounds. As highly social pack animals they are territorial and establish dominance through fighting. next » | 270 sample images from this category. Try a keyword search to see them all. Wolf drinks in a small tundra pond, Denali National Park, Alaska. Gray wolf lopes along the tundra in Denali National Park, Interior, Alaska. 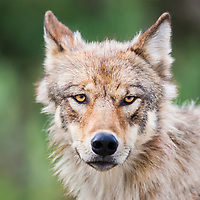 Gray wolf portrait, Denali National Park, Interior, Alaska. Gray Wolf on the tundra, Denali National Park, Alaska. Male Gray wolf, Denali National Park, Interior, Alaska. Gray wolf cub, Denali National Park, Interior, Alaska. Gray wolf cubs travel the tundra of Denali National park, Interior, Alaska. Wild gray wolf in Denali National Park, Alaska. 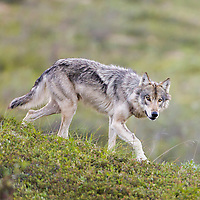 Collared gray wolf, Denali National Park, Interior, Alaska. Wolf pup of the year, Denali National Park, Interior, Alaska. Gray wolf, Brooks River, Katmai National Park, southwest, Alaska. Gray wolf in the Brooks River, Katmai National Park, southwest, Alaska. Gray wolf, Katmai National Park, southwest, Alaska. Wolf from the Grant Creek pack, Denali National Park, Interior, Alaska. Gray wolf on a mountain ridge in Denali National Park, Alaska. Arctic wolf, Brooks Range, Gates of the Arctic National Park, Alaska.